This entry was posted in Canada Immigration and tagged Canada Immigration Canada PNP Canada Work Permit Visa Canadian PR Express Entry System Federal Skilled Worker Program MoreVisas Skilled Trades Program work in Canada on April 2, 2019 by [email protected]. 2019 is the significant year for Canadian immigration as the outstanding immigration goal of 330,800. To achieve this latest target, it is likely that IRCC will have to ease some of their criteria. As the point-based system mainly manages Canadian immigration it may be that the points you require to qualify will be lesser than ever before. So, if you are questioning how many points are required for Express Entry in the year 2019, this article is for you. Though it is difficult to conclude what will be the minimum cut-off scores for this year as it only knows by the I.R.C.C, we can make some forecasts about the CRS points you will require to migrate to Canada in this year. There are mainly two separate points based systems associated with Express Entry if you aspire to immigrate to Canada by utilizing the Federal Skilled Worker program. The Express Entry system controls the pool of aspirants for Canada’s 03 immigration programs, namely the Skilled Trades Program, Skilled Worker Program, and the Canadian Experience Class. Most of the applicants appeal for the Federal Skilled Worker program because its criteria are the simplest to achieve if you do not have work experience in Canada. If you are not able to score sufficient points depends on the above factors, you will not be qualified for Express Entry, but you can go with the Canadian Experience Class and Federal Trades Program. The next step after meeting the minimum criteria is to create an Express Entry profile which is online, and it measured as per the second point system, know as Comprehensive Ranking System (C.R.S). Your CRS score is calculated by many factors including language knowledge, age, marital status, relationship to Canada, adaptability, etc. This score is utilized to rank your profile in the pool of Express Entry against other profiles. The I.R.C.C typically conducts Express Entry draws once every 02 weeks. Profiles with the greatest CRS scores have announced an Invitation to Apply (I.T.A) for Canadian PR. The invitations number issued per draw is set by the I.R.C.C, in a similar way they also manage the minimum required cut-off score for C.R.S. Understanding as we can only consider how many points are required for Express Entry in the year 2019, we must first take a look at the Express Entry draws of the year so far. Till date six draws conducted in this year with different minimum CRS cut-off scores. The median score of the previous 6 draws equal to 448. If you are able to obtain your CRS score near to this figure, you will have sufficient points for the Express Entry. 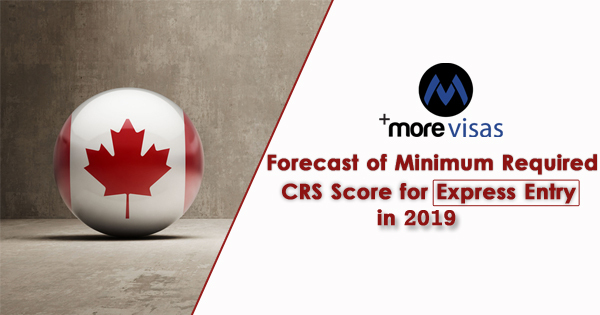 However, witnessing the Canadian immigration quota is much greater in this year, the I.R.C.C will have to conduct draws more frequently, or they will have bigger draws, both will result in the minimum CRS score to drop even lesser than 448. Please subscribe to MoreVisas newsletters and blogs to update with the latest information about Visa and Immigration. Please take our free evaluation to know whether you are suitable or not and our Immigration experts will help you to know further options available to you.